I just got another free subscription of another one of my favorite magazines. 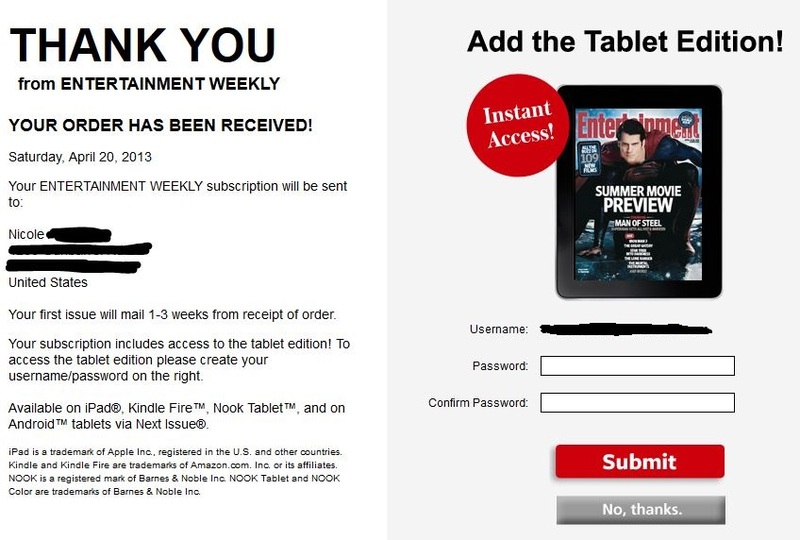 How did I get a Free 1 year subscription of Entertainment Weekly Magazine? Sign up or register at Recyclebank – you get 100 points for signing up. Then you can earn points doing different things. It’s all relatable to recycling, living green etc. which makes it fun for me. You can earn points by completing simple actions on the site, basically reading information. You can also earn points by actually recycling, and earn points by shopping at certain stores. Earn enough points to get your FREE 1 Year Subscription of Entertainment Weekly which is 400 points. All You magazine is 400 points too. Anyway, after signing up, you automatically get 100 points (I did). Then all I did was complete some actions and earned enough points in a matter of 20 minutes. You can keep checking back because they add new actions every so often to earn more points. There are other rewards to choose from too so you could always save your points for something else. Choose your reward and then it will be in “your rewards”. Go there, copy the redemption code and follow the link. Fill in your info including your redemption code and your all set! I also got an email with my account information from Entertainment Weekly so look for that in your inbox. Disclaimer: This is not a paid or sponsored post. This post may include a referral link.